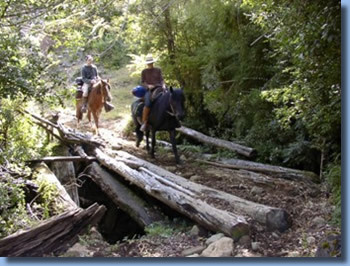 Starting from our Farm we explore the surrounding on horseback on short trails - 4 hours to two days. 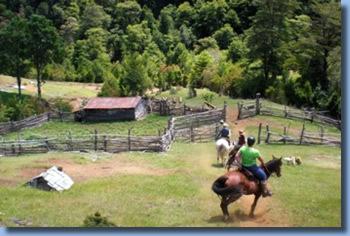 We begin every ride with an introduction to the horses and the Chilean style of riding because at Antilco we strive to give every visitor a personalized experience. Each rider is specifically matched to one of our 20 well-trained and sure stepping Criollo horses to ensure maximal enjoyment! 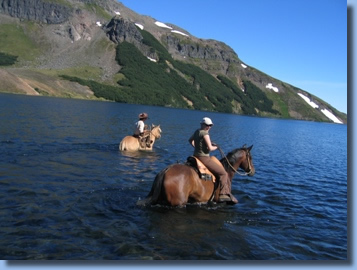 Our professional, bilingual guides take a hands on approach and will teach you along the way so that you learn to actually ride your horse, instead of blindly following the leader. From beginners to experts, everyone can experience their own personal freedom on horseback. 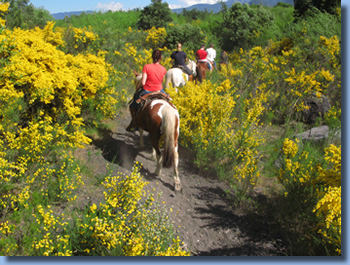 Get to know this pristine countryside and encounter the local people in Chile's most traditional manner: on horseback!. Tired of being led around on pony rides? 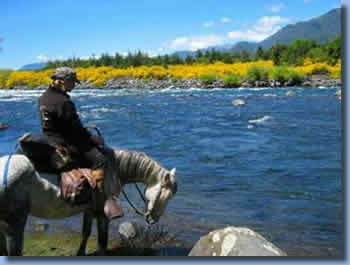 For those who want an opportunity to really ride, traveling country trails on a horse selected according to your skill level, we offer 3-4 hour half-day rides. Our standard ride follows a circuit through the Mapuche Indian community Quelhue, about 4 km away. It’s only Mapuche Indians living in this area, but not very traditional, no special cloths, no bow and arrow, just the way they live today. After passing the little village we cross a creek and have a break somewhere further up with nice views over Villarrica Lake in the distance. On the way back we ride on the banks of Trancura River, the biggest river in our area, with “La Leona” rapid, the second biggest on this section of the river. 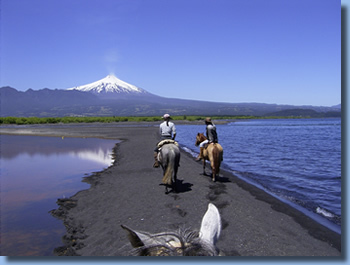 In many parts we enjoy great views over three volcanoes: Villarrica, Quetrupillan and Lanin. On this ride we usually go walking, trotting, cantering and galloping, but start quite slow so everyone gets used to his horse and the other way round: horses get used to you. 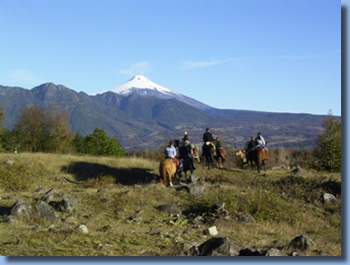 An alternative trail leads into the mountains of the national forest reserve Villarrica, right behind the ranch where we ride a loop with great views over the valley of Pucon, the 3 volcanoes and on the way back through meadows and along the banks of Liucura river. Usually we decide according to weather, group size etc which of the trails we ride this day. For the day ride we start picking you up in Pucon at 9.00 am. The route leads down to the Mapuche Indian Community. 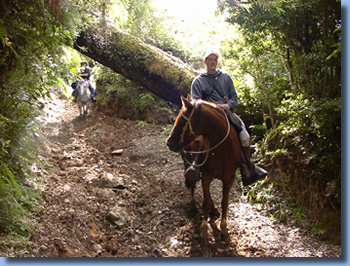 We ride into the Quelhue mountain range, part of the big “Villarrica National Reserve“ On the way up you can see very clearly how man interferes in nature, we start on farmland, ride through re-growing forest and end up steps away from untouched virgin rainforest with 40 meter high Coighue and Mañio trees. In this forest 3 families have cut their farms during the colonization of this area in the beginning 60ties of last century. The way back leads through similar landscape, first forest, later cultivated land in the valley following the Trancura River with“La Leona” rapid, the second biggest on this section of the river. 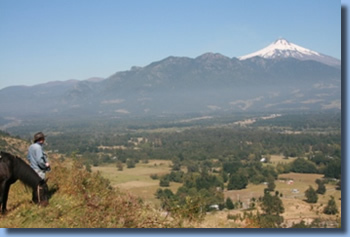 In many parts we enjoy great views over three volcanoes: Villarrica, Quetrupillan and Lanin. 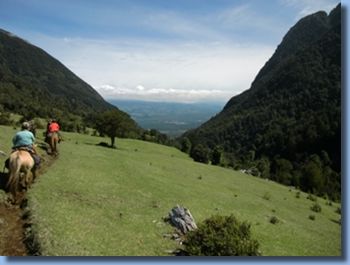 This trek offers a great adventure, even for the inexperienced rider. 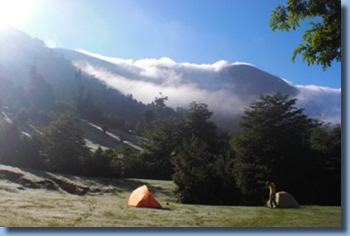 Experience invigorating mountain air and pass a unique night barbecuing steak on the open campfire and setting up tents between the grazing horses. 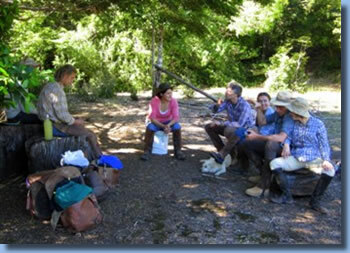 We leave from the farm and ride down the Liucura River Valley, crossing the Mapuche Indian community Quelhue and then begin our climb into the mountains. 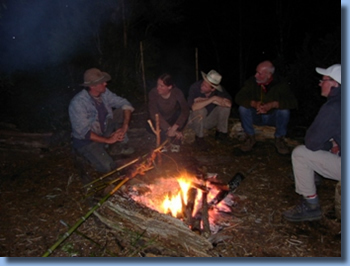 We ride up to an abandoned farm where we make camp and prepare dinner only a few steps away from native rainforest. On this ride we provide everything: from plates to spoons, sleeping mats, tents. You only need your personal stuff. 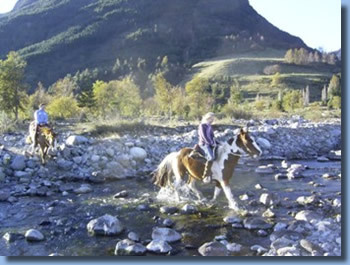 Riding is about 4 to 5 hours per day on horseback, the ride starts at 1 pm picking you up in Pucon, and you’ll be back on our farm around 4 pm next day. A video about one of the two trails we ride on our half day rides. 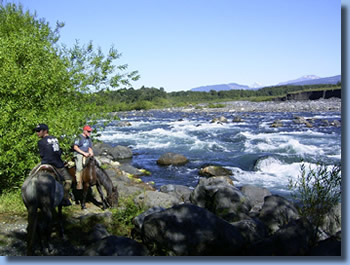 Riding the Mapuche community Quelhue and on the banks of Trancura river.